Happy Monday everyone! Piper and I are over here stretching and yawning from a long, but amazing weekend! I also realize I am a few days late with my monthly goals (*cough*slacker alert*cough*) but it's just been a hectic few days ya feel me!? :) This past week, Amanda was in town visiting and we were basically just having the best time ever at Texas Style Council. I am SO glad I attended this year and I'm so excited about all the things to come! Draft the BEST NFL Fantasy League Team EVER! Here is a playlist for your day/week! :) Loving these tunes right now while I work. XOXOXO! So glad to see you back and I can't wait to hear about TxSC! I so wanted to go but couldn't! Hopefully net year! 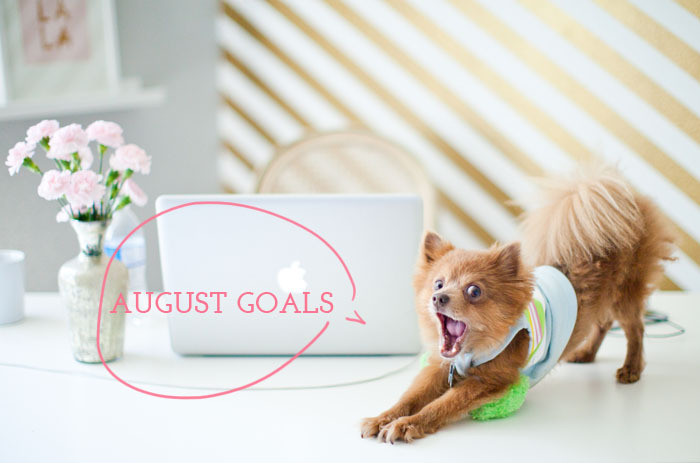 I need to make my August goals, too-- sometimes just making a list makes you feel much more accomplished! :) Can't wait to see more of your work blogged! You know we all love it! Happy Monday, girl! wow! you have accomplished so much! my list for this month includes go to texas, and then actually come back home. You are pretty awesome at completing goals each month! I still need to start doing posts like this. Piper is so flipping cute!! Love that shot.